YouTube Music could receive an audio quality upgrade | What Hi-Fi? When YouTube Music arrived on the scene in June, we wondered whether the music streaming service could hit the ground running and take the fight to the established giants, including Spotify, Apple Music and Tidal. But streaming services can be regularly updated, whether it's to tweak the app's appearance or to add new features. It seems YouTube Music is no different. 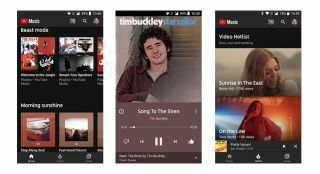 In an interview with Engadget, Elias Roman, YouTube Music's product manager, said the service will now receive regular updates every couple of weeks, including improved album sorting and better integration between YouTube Music and the YouTube video platform. There's also an audio quality update coming 'in the next few weeks', which will allow users to choose between low, medium or high audio quality for streaming and downloads. YouTube Music currently serves up tracks at a lowly 128kbps, which doesn't look (or sound) great when compared to rivals, such as Spotify (320kbps) or Tidal, which streams in CD quality (1411kbps) and even boasts hi-res via Tidal Masters. Whether these new updates will see YouTube bump its bitrate remains to be seen, but our fingers are well and truly crossed.